As I prepared for my first year of teaching, I was extremely excited. In fact, excited barely does my feelings justice. I just couldn’t wait. I’d be dying to teach for as long as I could remember. So I got my room ready, prepared my lesson plans, and couldn’t wait for the kiddos to show up. The first day went well, at least I thought so. And the second as well. But it wasn’t too long before I was having some fairly large disturbances in my class. 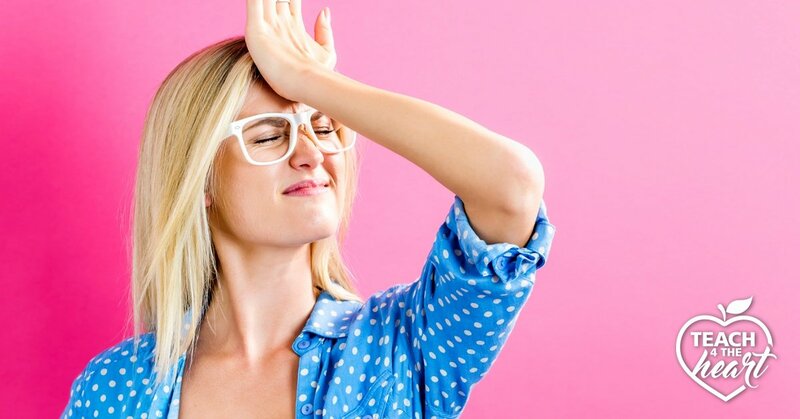 You see, I had made a crucial error. I had failed to address those very first discipline problems. They were just little things – a head down on a desk, a few students whispering, Jackson running into the classroom 10 seconds late. Not huge deals, I thought. You see, I really didn’t want to get on these kids for such small things. I didn’t want to whack them on the head with detentions and punishments the first week of school. And in doing nothing I created a nightmare for myself. When I let the little things go, pretty soon the little problems turned into medium problems. Then the medium problems quickly morphed into big problems. By this time I hadn’t addressed any of the little problems and very few of the medium problems, so how was I supposed to single out students to deal with the big problems now that the entire class was getting out of control? If you don’t deal with the little problems, they won’t stay little. And that’s the issue. If you don’t deal with the little problems, they won’t stay little. The kids will assume you’re not going to deal with problems and they’ll take more and more advantage. Pretty soon, your classroom will be a chaotic mess and you’ll be stuck. Okay, not completely stuck. There is always hope. (Check out my article “If Your Class is Out of Control” for some tips if you’re in the middle of the school year.) But it’s definitely going to be an uphill battle for the rest of the year. At the start of my second year, I knew I couldn’t make the same mistake again. I wasn’t going to let the small things go. I was going to catch and address those very first discipline issues, even if they didn’t seem like a big deal. I wasn’t going to hand out consequences. I was simply going to address each issue. I most likely wasn’t going to hand out any consequences. I was simply going to address each issue. For example, if Molly had her head down, I would simply say, “Molly, please sit up. Thanks!” If Jackson ran into the classroom, I would ask him to please go back to the door and reenter the classroom correctly. If Candice was late to class, I’d give her a break since it was the first week but I would remind her that she needs to figure out how to get here on time because next week we’d start keeping track of tardies. What About Talking and Blurting Out? I had a similar strategy for talking, but it was slightly more structured. When a student would talk, I would give him a formal warning. In my class, that meant I put their name on the board. But the key is just that they got a warning without my interrupting my flow of teaching. The first time it happened I would say something to the student such as, “Andrea, remember that you cannot be talking without permission. You’re not in trouble; I’m just putting your name here as a waning to remind you not to disrupt class. If you were to get two more warnings, you would receive [insert appropriate consequence here. ]” After that, every time a student talked out of turn, they received a warning as well. This advice can serve us well come February when we’re working with a challenging student and choose to give grace rather than nag them constantly. But, it is NOT good advice for the first week of school (unless you enjoy mayhem and screaming to get attention). During the first week of school, you are creating your classroom culture, and your students are watching to see how you’re going to handle things – and what they can get away with. But when you instead address minor issues and insist procedures are followed correctly, you show your students that your classroom environment DOES matter, that you should all take it seriously, and that you will hold them accountable. In doing so, you’ll prevent a whole host of problems and be well on your way to creating a conducive learning environment you & your students can enjoy all year long. 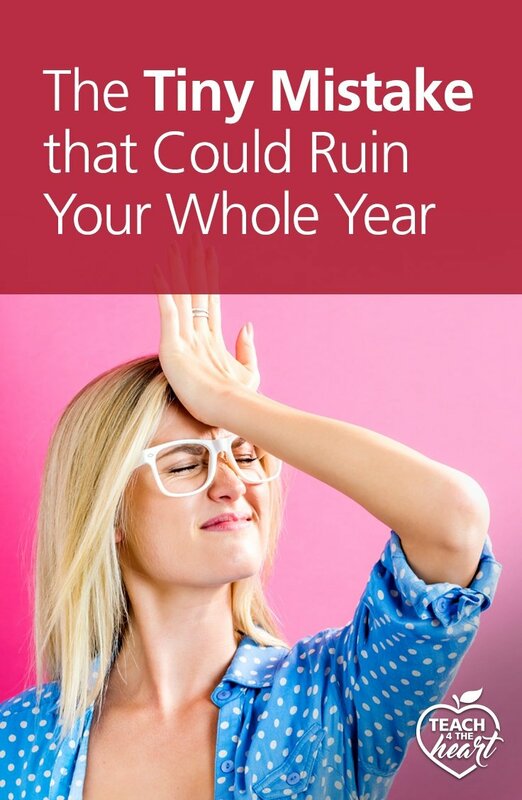 Have you had a year where you failed to deal with the small issues early on? What have you learned about classroom management and discipline during the first week of school? Want more helpful advice? I wrote Create Your Dream Classroom specifically to help teachers revamp their classrooms and prepare to have the best start of school ever. And don’t worry about finishing an entire book before school starts. The Back-to-School Power Pack will guide you straight to information you need to start the school year right. Click here to read reviews or order it now. Trying to figure out exactly how to make this all work? 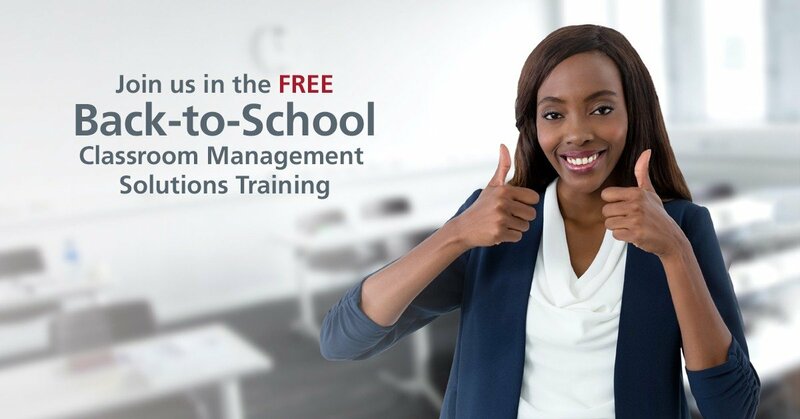 We'll go into a lot more detail in our FREE Back-to-School Classroom Management Solutions training. I am currently dealing with this. I have approx the same system that you have (writing names on the board). But I am not consistent when I apply it. I write the name of a student that is really disturbing, but not the student who is whispering, even though I know I should. Being consistent is really a struggle for me. Shirley, I totally know how hard it is to be consistent. I struggle with the same thing. My advice though would be this: don’t necessarily try to “lay down the law.” Instead, focus on being really consistent. And to do that, I would recommend NOT giving consequences for the first warning. Give a consequence on the 2nd or 3rd warning. That should help you be really consistent with giving out warnings (because if a student who is normally well-behaved is talking, you can go ahead & give them a warning without there being any real consequences.) And don’t give up – it’s really challenging to regain control, but if you’re consistent you will see progress. Oh, and with the students being mad at you – Yes, that happened to me, too. Just have a very simple answer ready such as “You are receiving a warning because you chose to talk.” And just say that and move on with class. If they really want to talk to you more say, “Talk to me about that after class.” and more on as quickly as possible. I really had to deal with this a lot when I was trying to correct things. It was tough but it got gradually better. Then the real magic happened at the start of the next school year when I started things right – so much easier!! Hang in there. You will figure it out! Thanks for the reminder! I have a great sign for myself : WHAT YOU ALLOW IS WHAT WILL CONTINUE. Helps me a bunch to keep my eye on the prize and remember I want them to respect me first, like me second. First-year teacher here…I teach high school freshmen. I have an array of personalities in my classes, ranging from outgoing but reluctant to work to withdrawn from class and apathetic towards consequences. The do-everything-the-teacher-says-and-turn-work-in-on-time students are right in the middle. I have struggled all year figuring out how to have a classroom management system that addresses all the personalities. I know that I NEED consequences, but the idea of consequences does very little to sway the apathetic students. Aside from those students, I have very bright students who could offer quite a bit to the class, but no matter how many times I redirect them, they choose to talk out of turn, get off topic, and say inappropriate things, so they get sent out of class. Any suggestions for creating a plan for the new year that can address the wide variety of personalities a teacher encounters at the high school level as well as the fact that there are numerous classes, not just one as it is in elementary? Hi Emily. As a first year teacher, it’s so hard to put together all the pieces you need to have good classroom management. Consequences are important, but they’re just one (small) piece of the puzzle. Thank you! Already signed up to attend the Back to School training. When I switched grade levels, I learned these lessons the hard way, now I’m going to use these tools to insure greater future successes. Thanks again for these powerful words of encouragement! I teach 3rd grade. Ive never been a fan of writing names on the board, so I use a blurt out chart. It has all class names on it and boxes for each day of the week. I use a different color marking tool for each day. If a student blurts, I put a dot in their box. They get 3 warnings (dots) before the higher stakes consequences which include: a reflection sheet, call home, missing a preferred activity to complete the missed instruction bc of blurting, principal meeting. I usually don’t need to use anything passed the dots. This is a great data collecting strategy as well. I use one sheet per month (you need to adjust for you). At the end of the month, I can see the different colored dots: it shows me my frequent blurters, days when blurting is worse, and it helps me reflect on my own teaching. If there is a high number on a certain day, my teaching style might’ve needed to be tweaked. I hope this is a helpful idea. Let me know if you have any questions. Thanks so much for such a valuable information.